Calgary’s Cycle Track Pilot Project has brought many positive changes to Calgary’s cityscape, providing cyclists with safety features that make their commute happier. In-between the green pavement and the cyclist, an active relationship is fostered. As bike wheels turn, the cyclist’s mind spins; every condition of the surrounding environment influences perceived safety. What is it that keeps cyclists from cycling in Calgary? How does perceived safety change between routes? 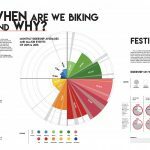 What does Calgary’s bicycle collision data reflect about Calgary cyclist safety, and how does this compare to perceived safety? 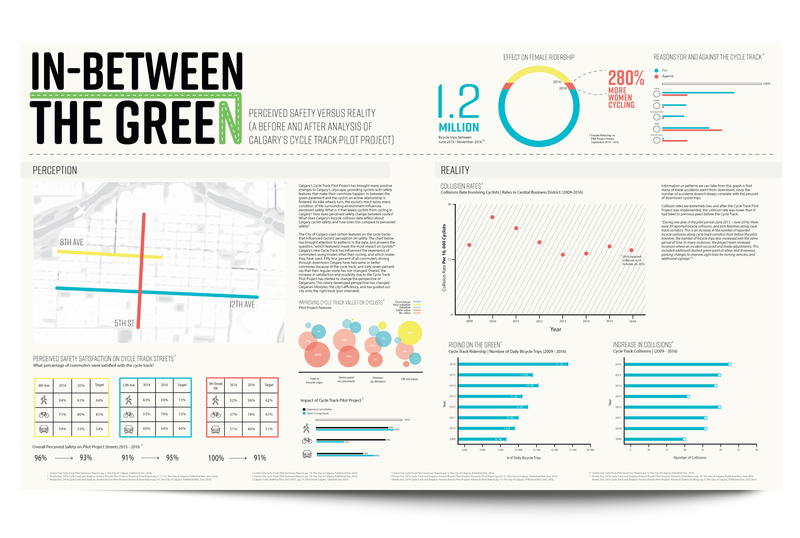 The infographic design strategically compares statistics relating to collisions, number of cycle trips, effect on female ridership, and conducts analysis of the perception of safety on Calgary’s cycle track before and after Calgary’s pilot project.